All photography by Brady Architectural Photography. 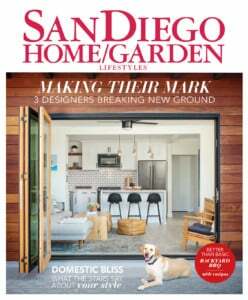 Maureen Feary loves her rambling California ranch-style house in the wooded area of Point Loma but, she says, “the master bathroom was a short fall.” And by short, she means limited in style, counter space and tiny for her 6-foot stature. With a shower and toilet room shoved off to one side and an adjoining room containing two mirrored closets flanking long walls and matching tiny vanities separated by low partitions, it was no surprise that the area felt claustrophobic. Linda provided several options for Maureen to look at in regard to the major change she requested for her bathroom. Although Maureen agrees they were all lovely, a couple were too delicate for her taste. “In general, I am pretty tailored in my preferences. I play sports, I own a business and I didn’t need it to be so refined,” she explains. Although a glittering chandelier was not her aesthetic, the elegant marble—in combination with a daring concrete tile Linda showed her—fit her energetic personality like an oar fits an oarlock. “The marble is beautiful and the contrast just makes it look fresh and bright and gives it pow!” she says. 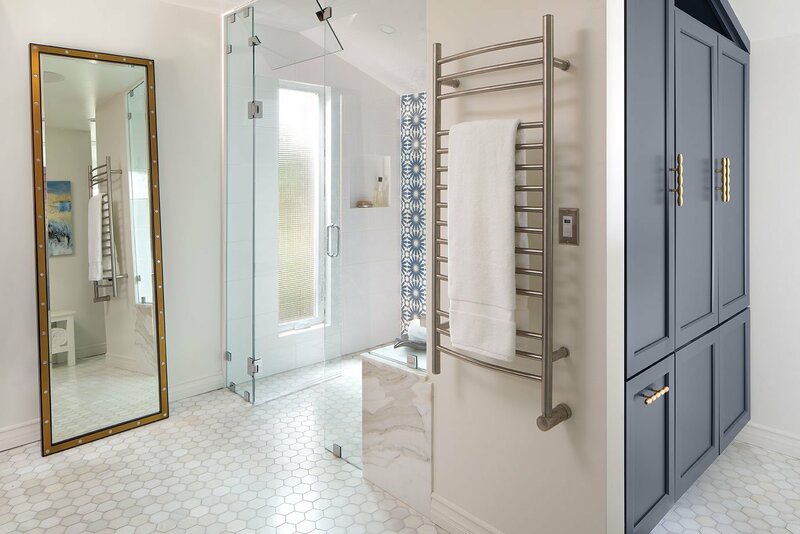 Large format subway tiles in a sophisticated white live next to the high-spirited concrete on the shower’s backsplash wall. There is no tub. 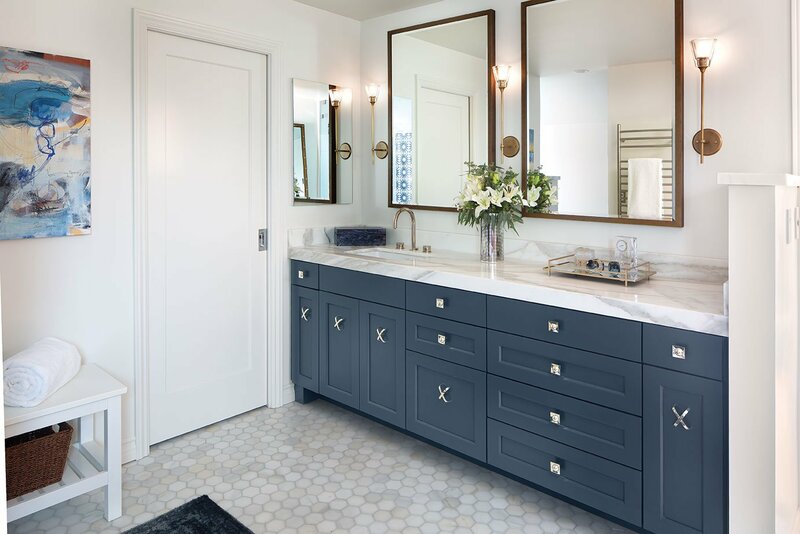 • The Devotion Mariposa collection from Oceanside Glass in Carlsbad remains Linda’s go-to pattern when she wants beauty and drama in powder rooms or the backsplash behind a bar. 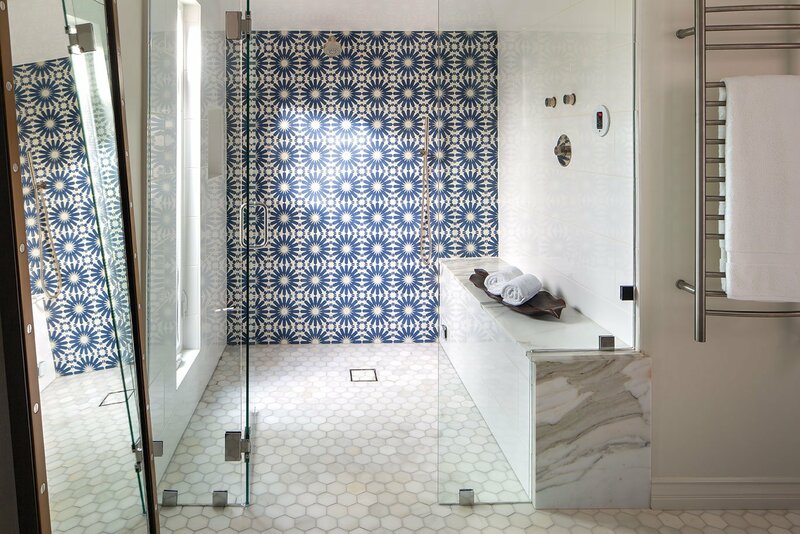 “These tiles are both earthy and glamorous,” she says. • Walker Zanger’s Kaza concrete collection (below) is both neutral and architectural. 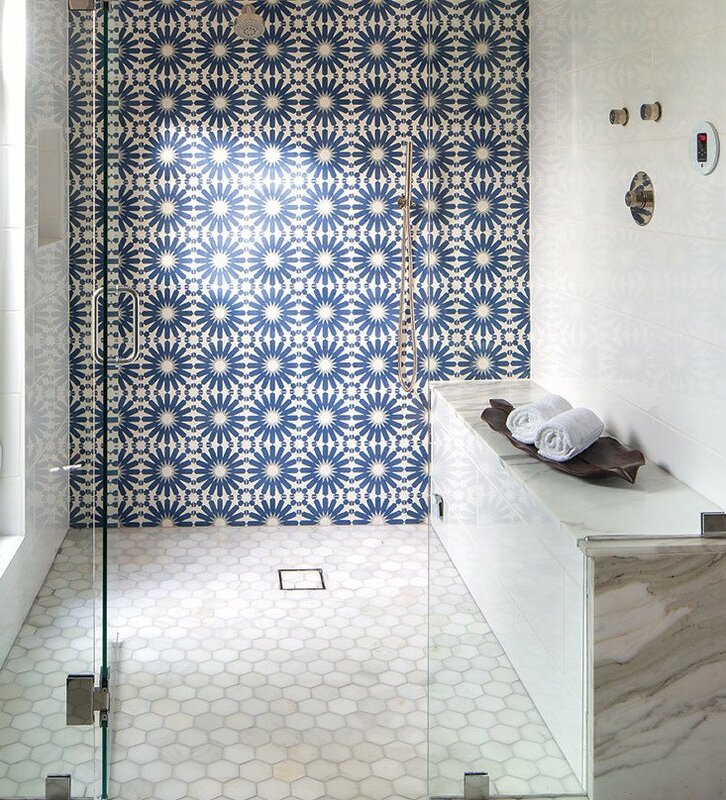 • “Beautifully understated and stunning in White Gloss, the Chaine Homme tile from Fireclay Tile is just divine,” Linda says. 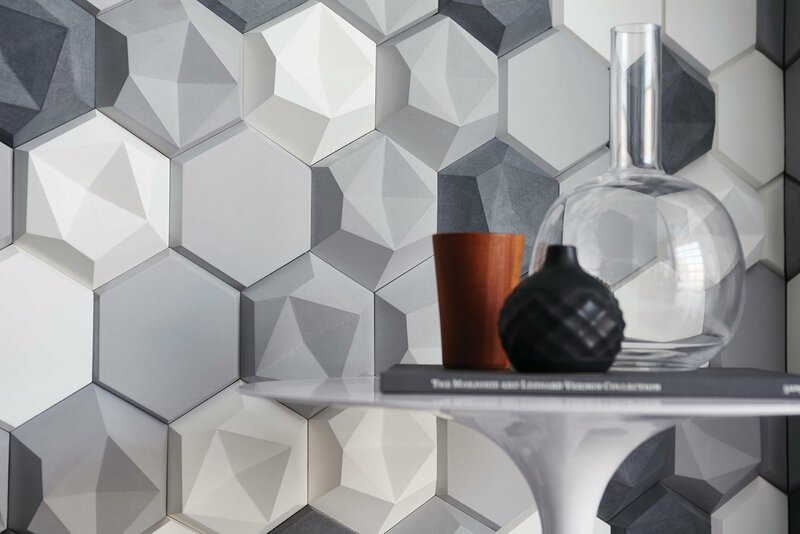 Walker Zanger’s “Kaza” concrete tile.